Many of us who are saved have never truly grasped the magnitude of suffering that our Savior went through on the cross for us. If we did, there would be a radical change in how we live. Many of you who are lost – if you truly understood how much Jesus suffered for you, you will respond to His love and be saved. Jonah 2:1-6 1 Then Jonah prayed to the LORD his God from the fish’s belly. 2 And he said: “I cried out to the LORD because of my affliction, And He answered me. ‘Out of the belly of Sheol I cried, And You heard my voice. 3 For You cast me into the deep, Into the heart of the seas, And the floods surrounded me; All Your billows and Your waves passed over me. 4 Then I said, “I have been cast out of Your sight; Yet I will look again toward Your holy temple.’ 5 The waters surrounded me, even to my soul; The deep closed around me; Weeds were wrapped around my head. 6 I went down to the moorings of the mountains; The earth with its bars closed behind me forever; Yet You have brought up my life from the pit, O LORD, my God. Overall Background: Anytime we study a biblical passage, we have to first look at it in its original and immediate context. In other words, we need to understand it as the people who first read it understood it. Then, we can take step back and look at it from the larger and fuller context. 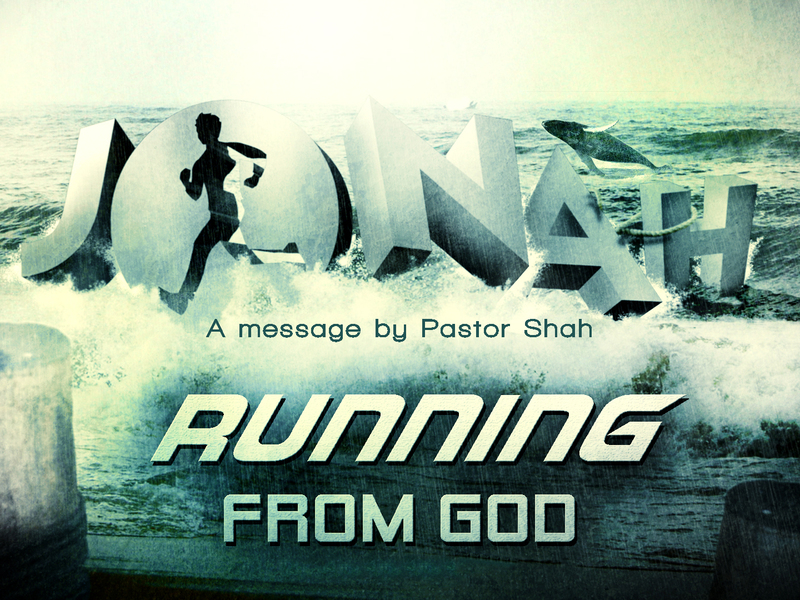 So far, we have seen what the life of Jonah teaches us from its original context. It teaches us to obey God, accept God’s discipline, and trust His faithfulness in our lives. Now we need to step back and see it from the larger context. What does the rest of the Bible say about Jonah? How does it fit into God’s plan of salvation? Well, Jesus mentioned Jonah at least twice in His ministry. When the scribes and Pharisees came to test Him and demanded a sign from Him. Jesus said in Matthew 12:38-41 39 But He answered and said to them, “An evil and adulterous generation seeks after a sign, and no sign will be given to it except the sign of the prophet Jonah. 40 For as Jonah was three days and three nights in the belly of the great fish, so will the Son of Man be three days and three nights in the heart of the earth. 41 The men of Nineveh will rise up in the judgment with this generation and condemn it, because they repented at the preaching of Jonah; and indeed a greater than Jonah is here. Jesus compared His death, burial, and resurrection to Jonah’s experience in the belly of the great fish. In a sense, if you want to understand how Jesus felt on the cross, read how Jonah felt inside the fish. This morning I want us to look at Jonah 2 and understand what Jesus went through on the cross for us. Is all this just to teach you something interesting and novel? No. It is help you realize how much Jesus suffered for us. If you are saved, this should motivate you to live a godly life. If you are lost, this should motivate you to get saved immediately. I. THE CROSS IS GOD’S ANSWER TO SIN. – It is true that the chief priests and the elders plotted against Jesus to kill Him. – It is true that Satan incited Judas to betray Jesus was 30 pieces of silver. – It is true that the crowd shouted crucify Him. – It is true that Pilate passed the sentence and then washed His hands. – It is true that the Roman soldiers brutally nailed Him to the cross. But the cross was from start to finish the work of God. – I Peter 1says, 18 “knowing that you were not redeemed with corruptible things…19 but with the precious blood of Christ…20 He indeed was foreordained before the foundation of the world. It is true that human beings crucified Jesus, the Son of God, in a cruel, heinous, and evil way. Nonetheless, it happened just as God intended for it to happen. The cross was not an atrocity. The cross was not an accident. The cross was not an afterthought. The cross was God’s answer to your sin and mine. Application: What do you think about the cross? Jesus took your punishment upon Himself so you don’t have to suffer in Hell one day. II. THE CROSS IS GOD’S PUNISHMENT FOR OUR SINS. 2 And he said: “I cried out to the LORD because of my affliction, And He answered me. ‘Out of the belly of Sheol I cried, And You heard my voice. In his affliction Jonah cried out to God. The pressure was too much for him. How about Jesus? So also Jesus, in His ultimate affliction, cried to His Father in the Garden of Gethsemane. Luke 22:42-44 41 “…He knelt down and prayed, 42 saying, “Father, if it is Your will, take this cup away from Me; nevertheless not My will, but Yours, be done.”43 Then an angel appeared to Him from heaven, strengthening Him. 44 And being in agony, He prayed more earnestly. Then His sweat became like great drops of blood falling down to the ground. That condition is called “Hemidrosis,” where a person is under such severe stress that the tiny capillaries in the sweat glands break and blood and sweat flow down together. Jesus was under extreme affliction because He knew what was coming. Jonah’s affliction was his own doing. Jesus’ affliction was because of our doing. Back to Jonah 3 “For You cast me into the deep, Into the heart of the seas, And the floods (Literally: river swirled about me) surrounded me; “All Your billows (breakers) and Your waves passed over me.” We know what that meant for Jonah – he was in belly of the fish and the fish was deep in the sea but inside the water was like a raging river. He was being tossed back and forth. How about Jesus? On the night of the crucifixion Jesus was jerked back and forth. Arrested in the Garden of Gethsemane. Taken before Annas the ex-high priest and questioned. Taken before the Sanhedrin and condemned and beaten. Taken before Herod and mocked. Taken back to Pilate and scourged with 39 lashes. His back was probably in shreds. Then He had to march up the hill to Golgotha. He was bloody, bruised, dehydrated, and exhausted. Finally, He was nailed to the cross between two common criminals. The nails are not what you use to hang picture frames. But the worse was the sin of every human being put upon Him and God’s wrath was poured upon the Son. This spiritual suffering was the worst. Back to Jonah 2 4 Then I said, “I have been cast out of Your sight; Jonah felt abandoned by God. How about Jesus? Matthew 27 45 Now from the sixth hour until the ninth hour there was darkness over all the land. 46 And about the ninth hour Jesus cried out with a loud voice, saying, “Eli, Eli, lama sabachthani?” that is, “My God, My God, why have You forsaken Me?” As Jesus feels the emotional, physical, and spiritual suffering of the cross, He feels abandoned by His Father. Back to Jonah 2’ 5 The waters surrounded me, even to my soul; The deep closed around me; Weeds were wrapped around my head. I find this interesting – Jonah had weeds wrapped around his head. How about Jesus? John 19, 2 And the soldiers twisted a crown of thorns and put it on His head, and they put on Him a purple robe. Back to Jonah 2 6 I went down to the moorings of the mountains; Jonah is saying that he has gone as low as any human being could possibly go. How about Jesus? For 3 hours Jesus hung on the cross for our sins. He went as low as possible for us. How about Jesus? Luke 23:46 And when Jesus had cried out with a loud voice, He said, “Father, ‘into Your hands I commit My spirit.’ ” Having said this, He breathed His last. Let me clarify – Jonah was disciplined for his disobedience. Jesus was punished for our transgressions. Application: Did you ever realize how much Jesus suffered for us? By the way, you and I have no right to tell anyone that they will go to heaven without Jesus Christ. It is as if saying – Jesus, you really didn’t have to go through all that. III. THE CROSS IS GOD’S PROMISE OF A NEW BEGINNING. Jonah 2, 6 Yet You have brought up my life from the pit, O LORD, my God…9 Salvation is of the Lord.10 So the LORD spoke to the fish, and it vomited Jonah onto dry land. How about Jesus? Listen again to Peter in Acts 2:24whom God raised up, having loosed the pains of death, because it was not possible that He should be held by it. Praise God! Jesus did not remain in the grave. He came back to life on the third day. Why? Because He was God. He was sinless. He had finished the task of paying for our sins. Why did I preach this message? Because it is Palm Sunday? No. Because it is Interesting? No. Because the cross demands a decision. Is Jesus your Savior? For e.g. There was once an artist named Steinberg. He was using a young gypsy girl as a model for one of his paintings. Sometimes she would just come and watch him paint. One time Steinberg was painting his masterpiece “Christ on the Cross.” One day she said to him – “He must have been a very wicked man to be nailed to a cross like that.” Steinberg replied – “Oh no. Actually, He was a very good man. The best man who ever lived. He gave His life for others.” The gypsy girl asked him – “Did He die for you?” Steinberg stepped back and thought to himself – “I don’t even know the one I am painting.” He gave His heart to Christ. Why? He moved from the color, canvas, and palette and He moved into the story. Have you ever moved into the story?